It can't be denied it's been a pretty exciting 12 months since the release of their 'Mirrors' EP. Playing shows alongside Lostprophets, Taking Back Sunday and even Bon Jovi has increased the bands popularity and opened them to a wider audience. Now with a fair bit of hype behind them, 'All Our Kings Are Dead' sees the light of day and is likely to win over more fans. Recent singles 'Sons Of Apathy' and 'Crystal Clear' kick off the record strongly with the bands tight, melodic hard rock style with the former bring a anthemic atmosphere that soars, whilst the latter is a pounding slice of radio rock that fits the bands style well. Throughout they keep up their momentum with tracks like 'Weight Of The World' and 'D.O.A.' have plenty of weight and their well-tempo approach mixed with brilliant vocals from Gustav Wood being a main stay from start to finish. Elsewhere 'After The War' is a more laid back Young Guns with a nice atmospheric complimenting the bands intricate guitars. Whilst 'Winter Kiss' and 'Elements' soar strongly and keep you interested, as the bands how presentation is approachable and pulled off well. Towards the end of the album, 'At The Gates' is captivating merely because of Wood's highly impressive vocals before 'Beneath The Waves' gives us one last blast of straight-up rock. Over the space of 50 minutes here, there is enough to keep you interested and the bands overall talent lives up to whatever hype they have. Additionally their craftsmanship is one of honesty and does not see the band becoming something they are now. Instead we're given twelve impressive pieces of rock that is both heavy and approachable. Whilst this may not seem instant, after a few listens you finally start to appreciate the bands hard work. 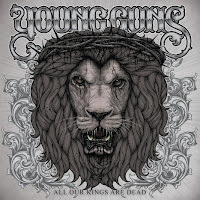 'All Our Kings Are Dead' by Young Guns is released on July 12th through the bands own label, Live Forever Records. 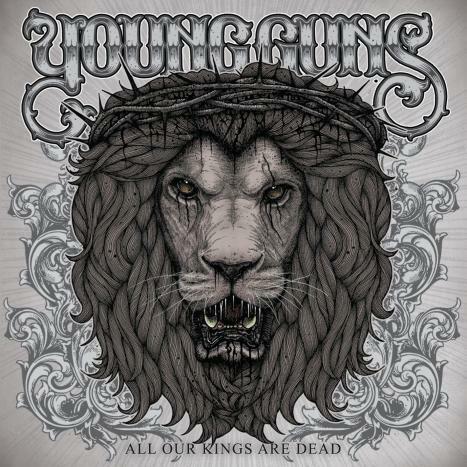 Young Guns on MySpace, Twitter and Facebook.